Ramona Writes, "Again. ": Hello Muddy March! 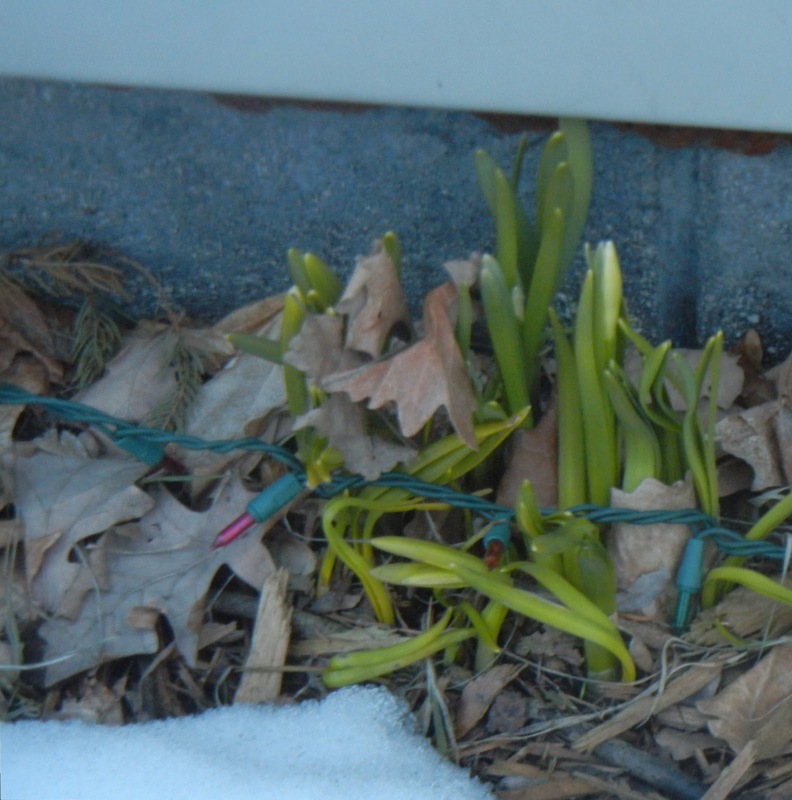 Daffodils emerge next to Christmas lights still frozen to the ground. The blanket of snow is beginning to melt down in southeastern Wisconsin -- a welcome sight. It may still be winter, but spring IS coming! Next to the house, where the white covers have already been partially stolen away, pregnant daffodils are stretching out -- their baby bumps already beginning to show. Yesterday, I looked out the sunny window, excited for what is to come. The ailing vitamin D in my bloodstream has been begging to reproduce. Yet I grimaced as I stepped outside, fierce cold winds chilling me to the bone. Oh yeah, that un-melted snow everywhere... those piles of frozen flakes that I've almost stopped seeing because they've been there so long... they should have been a *clue* that it's not warmed up yet! We seem to forget after a while that green grass does grow here. Yes, it will flourish again with bees and butterflies frolicking amongst. Bugs and insects? I saw a fly yesterday in the upstairs of the church building and wondered where in the world it came from. Oh yeah, they do still exist. But at this point in winter, the recollection of what is soon to come again has faded. It seems like memories of soft green carpet are from another piece of property we moved away from a long time ago. The colorful garden catalogs began arriving in the mail last month. Ironically, we had to shovel the snow from a recent storm away from our mailbox so that the postal worker could deliver them. You're kidding me, right? But if I don't order now I risk the plants I want being sold out to everyone south of us. Another long year will pass before I even get to think about how I'll enjoy them. I find myself looking at photos to remind myself what our yard really looks like underneath its winter coat, and resolving again to plan my summer gardening in the fall, when the ground and its contours are still visible. But today. Today was different. I prowled around outside in just a sweater over a long-sleeved shirt. It took some doing, but I managed to scale my way along the front of our house and over to the side. I inched along the snow-covered balance beam that keeps the thawing dirt from the flower bed in place. If the neighbors glanced over, they were rewarded with an entertaining show as I slid around and down. But I snagged encouraging snapshots of life poking through to the light as I slipped. What's fascinating to me, though, is that growth is already there, even when unseen. As I look out over our fluffy white yard, it's secretly filtering rays of energy through to what's awakening underneath. Colder than a glass block room, but similar in principle; the snow shelters and protects those tender plants until it's warm enough for them to be out on their own. Slowly it seeps in, recharging the soil as it disappears, then flowing up through the roots to help those tender shoots stand tall. So long, snow. I'll kind of miss you. We loved sledding down you in hills piled high. Our dog thoroughly enjoyed your seemingly unlimited supply of unflavored slushies. We'll catch you again next year. And, welcome spring! You're not quite here yet, but I can see you making your way towards us from a distance. It's been too long since we've seen each other and I cannot hardly wait until you arrive.